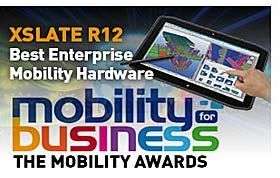 AUSTIN, Texas — Xplore Technologies Corp. (NASDAQ: XPLR) today announced that its XSLATE R12 rugged tablet PC was recognized with the Mobility Award at the 2017 Mobility for Business tradeshow in France. The high-performance 2 in 1 Windows® tablet was named the “Best Enterprise Mobility Hardware of the Year” by a panel of 12 IT journalists and mobile industry experts who were impressed by its thoughtful rugged, yet innovative, design. They particularly liked that the XSLATE R12 was built for enterprise mobility use and that its professional-grade capabilities natively satisfy this market’s more advanced mobile computing needs.